This image hopefully showcases what I consider to be a very beautiful Bruder Fair Organ from the late 1800s. The owner was gracious enough to let me photograph the piece, which has the most lovely colors on its carved surfaces. The founder of the Waldkirch organ industry was Ignaz Bruder, 1780-1845, and he was the master teacher for several german organ builders, and four of his sons founded the business Gebruder Bruder. Two of those sons, Wilhelm and Arnold, founded their own organ factory under the name of Wilhelm Bruder Sohne. I assume this piece was done by them because that name is painted across the middle, above the figure. I did not hear the organ play,but I bet it really resonates for blocks when it does play. I am by no means an authority on these organs, but doing a little research on the net, it was hard to find two organs that looked the same, so quite possibly each piece was one of a kind. The craftsmanship is simply mind-boggling. I light painted the whole room to give it a dreamy look. Can you imagine anyone having the ability or desire to create such a masterpiece today? It not only is beautiful to look at, but the music it produces most certainly delighted countless crowds way back when as well. The Golden Age of Music. Today I wanted to share a photograph I did recently showcasing a beautiful Wurlitzer 125 Military Band Organ that dates back to the early 1900s. 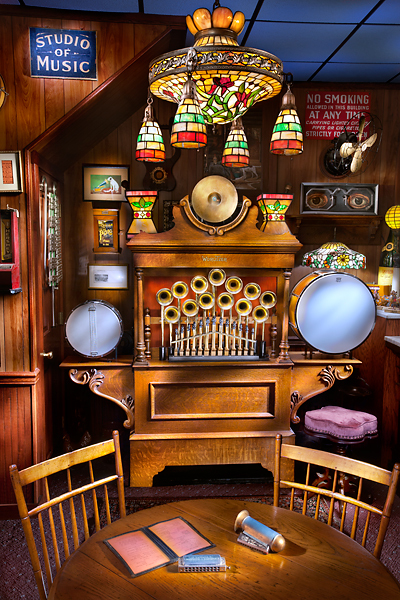 This amazing musical instrument is from an era when automobiles,airplanes and electric lighting were all new. Given the opportunity to photograph such a marvelous old piece, I cant help but think of the generations of people who must have had a smile on their face as they listened to this mechanical wonder. 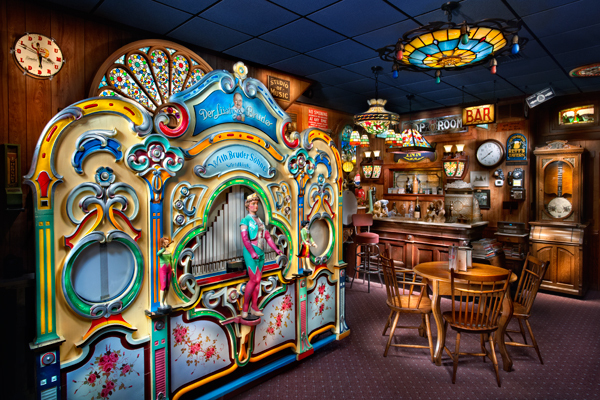 This organ would have played in a variety of locations, such as skating rinks and carousels and can supposedly really fill the air with a tune. As an artist, I have always found music to be very inspiring, and the ability that many musicians and singers have to take you to places that let your spirit soar has always fascinated me. This old instrument undoubtedly captivated the imagination of those who heard it play as they skated or simply enjoyed special times with family and friends. Most certainly, anyone from an older generation would have fond memories come flooding back from their youth if they were to hear this classic come to life. I must extend a very special thank you to the owner of this piece, for allowing me access to capture something so beautiful, and also the opportunity to express my creativity through my photography. Things like this are not seen every day, and it affords ones imagination an opportunity to dream of things of wonder and beauty from times past.The original catalog states it is a 44 key instrument designed for small to medium size rinks. It lists instrumentation as outside visible-13 Brass trumpets, 13 Brass Piccolos, 13 Wooden Flageolets, 2 Drums,and a Cymbal. Inside it has 5 Wooden Trombones, 5 Open Basses, 13 Open Pipes, 6 Stopped Pipes, 11 Pipes in Accompaniment. Bottom- 5 Stopped Basses, 7 Stopped Pipes, 10 Pipes in Accompaniment, 1 Stop for Trumpets, 1 Stop for Trombones, 1 Stop for Piccolos, 1 Stop for Flageolets, Bass Drum and Cymbal.After reading about all the instruments, it’s probably good I did not ask to hear it play in a closed setting. Shipping weight was noted as 800 pounds.There are also two harmonicas lying on the table to echo the whole music theme, and the one is called a Hohnerphone that utilized a small horn like amplifier. Another very cool old instrument on a smaller scale of course. For many seeing this image may invoke visions of merry go rounds, circus midways or other childhood memories that few other automatic instruments can match. I hope anyone seeing this image enjoys it as much as I did photographing it.